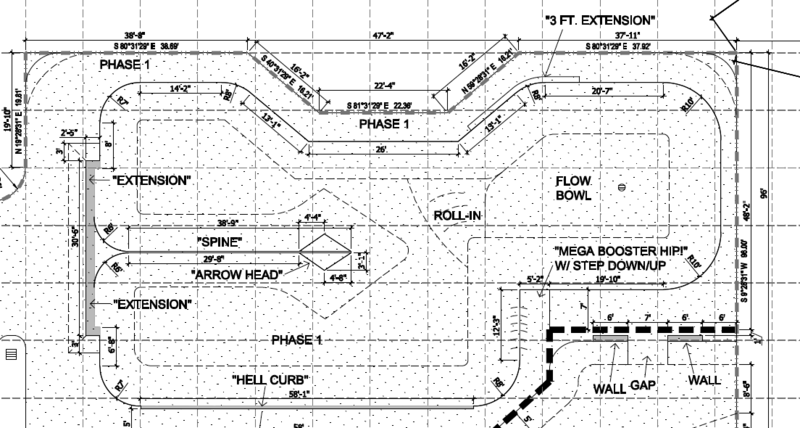 Big Berry Hill Skatepark Update! We have some exciting news to fill you in on. 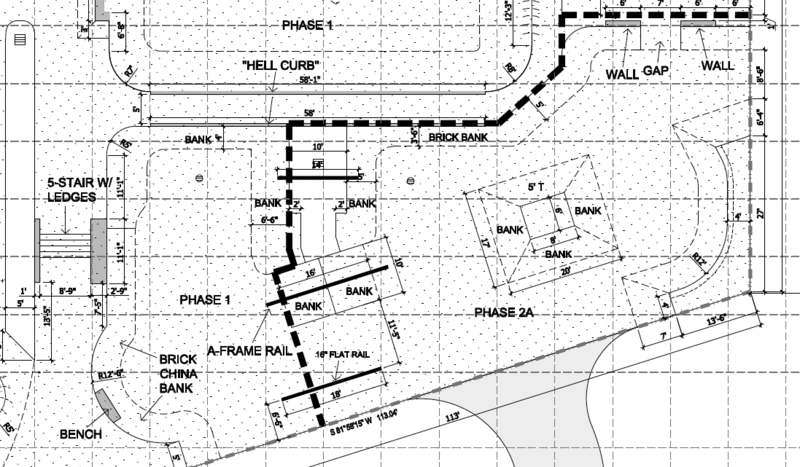 Below you will see the updated design of the new park at Berry Hill. Construction is set to begin this month! The park, pictured below, has a budget of $600,000. The City of Lexington has committed $575,000 toward the new park. Thanks to partners like you, today Friends for Skateparks donated $17,530 from our fundraising efforts to the city of Lexington for the Berry Hill Skatepark project! A BIG thanks to all who have helped so far!!!! 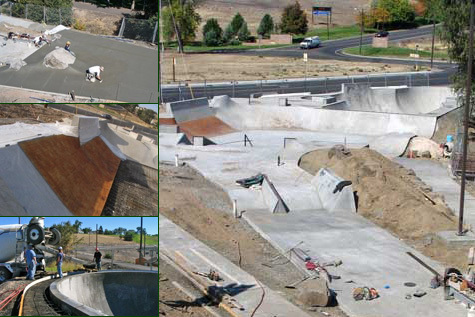 However, the $600,000 being spent on the skatepark does not include much needed site amenities improvements such as landscaping, lighting, benches, fountains and signage to name a few. We are also hoping our fundraising efforts will be successful enough to add an additional phase to the park! The site work that is needed will cost around $35,000 and the additional phase will likely cost between $80,000-$90,000 – which we can help raise with cash and gift-in-kind donations. Now is the time! 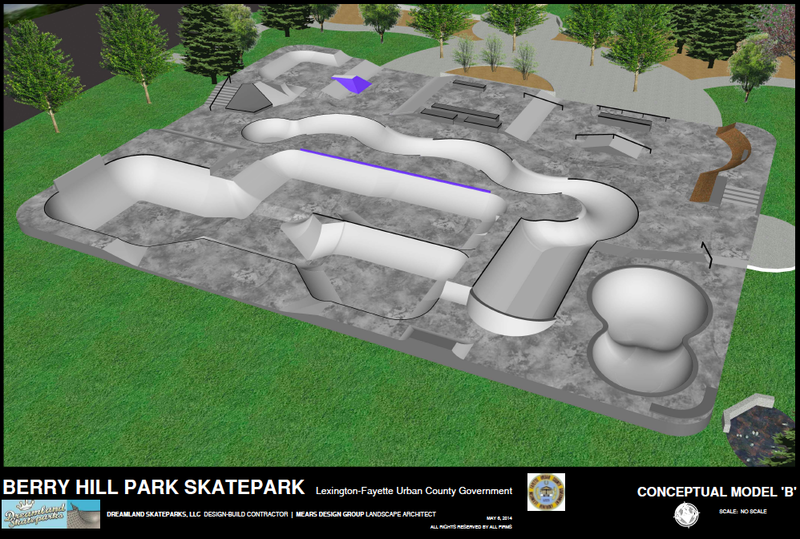 If you or a business you know would like to help us reach our goal we have a number of opportunities to provide you with special recognition for supporting Lexington ’s next world-class skatepark. You can help today by purchasing a Brick (2×4, $250 or 4×4, $500) with an engraving of your choice that will be featured in the park! * 5 bedroom home? – Do you or someone you know have a 5 bedroom house near Lexington available from January through March (the completion of the park) that they could offer to workers coming in for the project? * Wood? – Contact us to see a specific list of lumber needed for the project. Businesses can donate lumber and receive tax incentives. We also are approaching local companies regarding donated and discounted machinery, concrete, landscaping, and other supplies. If you own or know someone who owns businesses that sell these items and would like to help, please let us know. Please Note: There could be minor changes made to the design, but this will be the general footprint. Click Image To Enlarge! 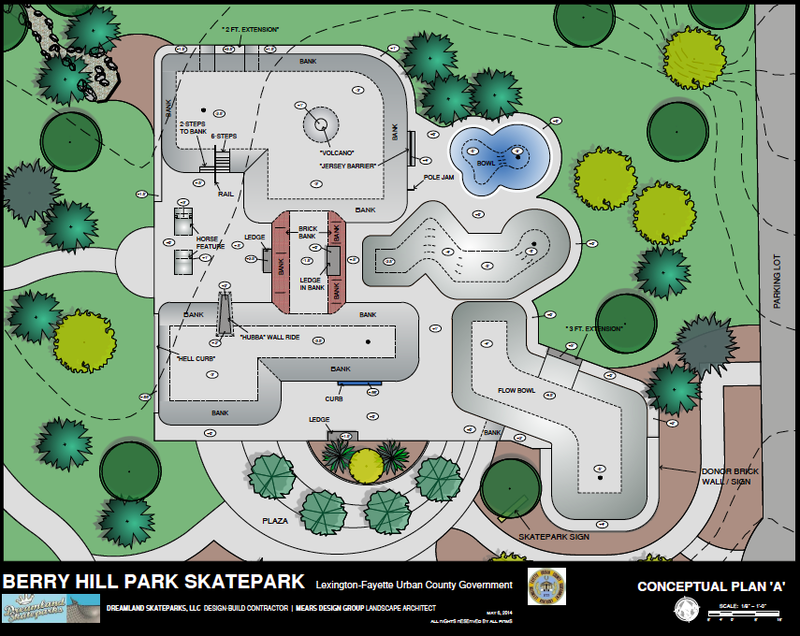 Tags: Berry Hill Skatepark, Design, Fundraising, Lexington Ky | Permalink. Here Are The Proposed Designs!!! 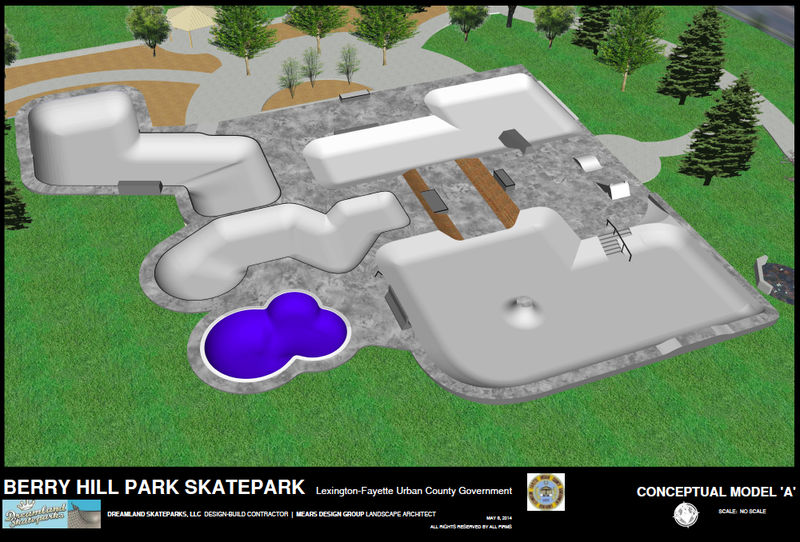 Below is concept A and concept B presented to us tonight by Dreamland Skateparks. A few things to note. 1. You can still email your thoughts and suggestions to Dreamland for 1 WEEK. Email your suggestions (or encouragments) here: berryhilldream@gmail.com Please make sure you fully understand what you are looking at in these designs before you email them. 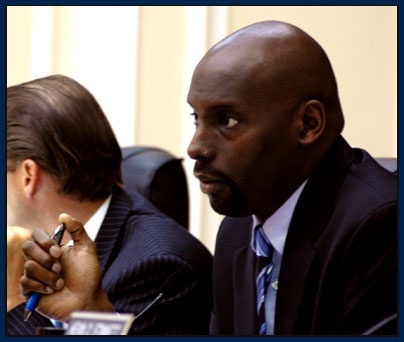 If you have questions then post them and those of us at the meeting will do our best to answer your questions. 2. A lot of good suggestions came from the meeting tonight. 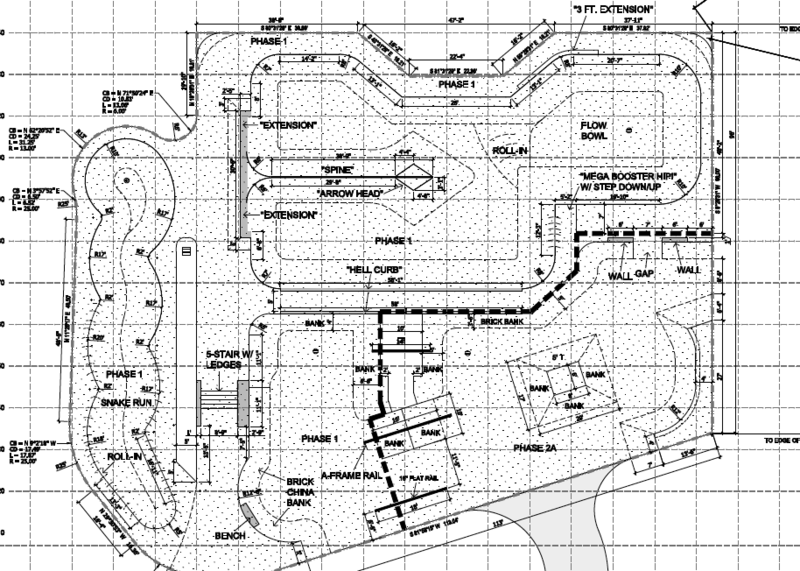 There seemed to be a general consensus that moving the snake run out of the middle of the park and making the street area a bit larger would be a good idea. 3. With the communities support over the next two months, there is a very good chance that the park will be larger than these concepts with elements from both being included. Donate HERE! I will offer my opinions later, but for now, enjoy taking a look!!! 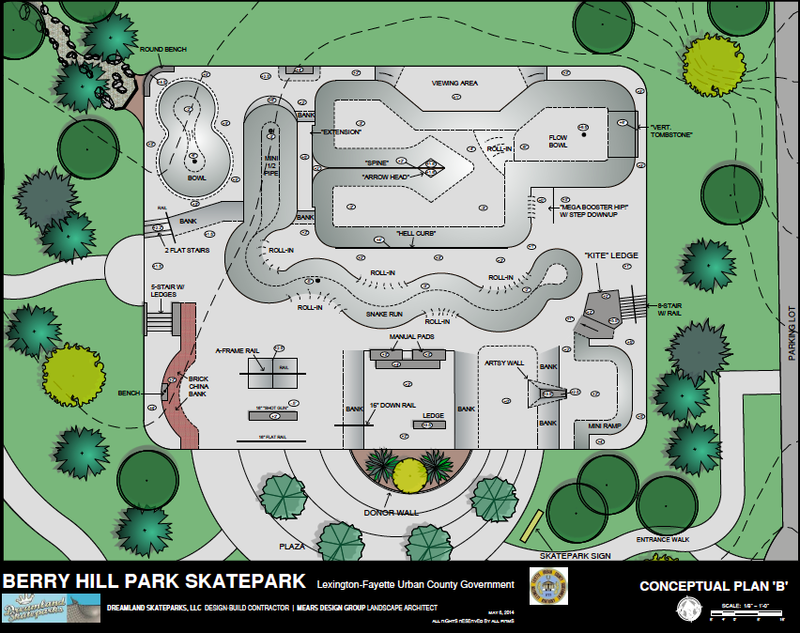 Tags: Berry Hill Park, Design, friends for skateparks, Lexington, Skateboarding | Permalink.